After the ludicrous time that I had reading Demons of the Ocean, I fancied going back to something a bit more familiar. Discworld it was then. About as ridiculous, but actually on purpose, so it almost doesn't count. Men at Arms returns to Ankh-Morpork's City Watch at a rather strange period in their history. 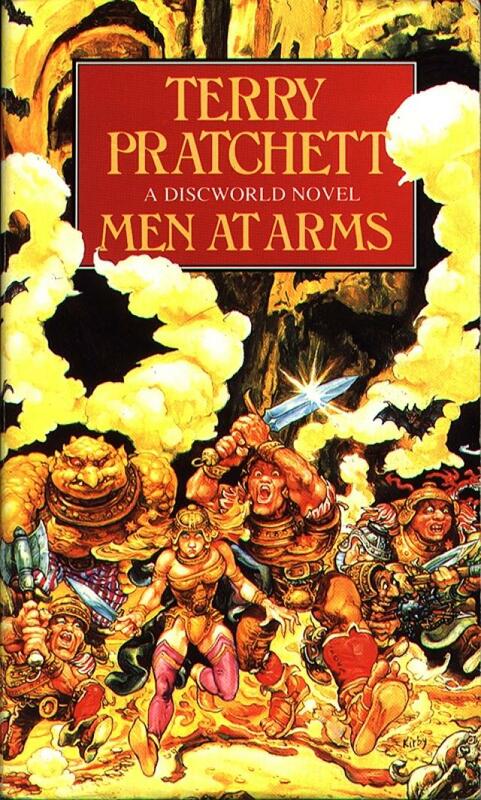 In the lead-up to his wedding/retirement, Sam Vimes has to deal not only with three new recruits (Cuddy the dwarf, Detritus the troll and Angua the w-(oman?)) that the Watch has been forced to take on to improve their ethnic diversity, but with a series of strange events that the Assassins' Guild have been very keen for him to ignore. As tensions rise between guilds and between species, the Watch have to find out what they intend to be when times are tough. I loved Guards! Guards!, so I was really looking forward to Men at Arms and I was not disappointed in the slightest. Perhaps the thing that surprised me most was the unexpected moments of seriousness that are sprinkled throughout. Rather than feeling out of place though, they give the members of the Watch a lot of depth and nuance that was mostly missing from their previous instalment; the only aversion to this is Corporal Nobbs, who does get development only for it to make him more absurd. In particular I liked the development that Carrot received, who has mostly gotten past his naive veneration of the law and is now sly enough to follow those laws closely enough that it puts a spanner into everyone else's plans. At the very least, it was entertaining to watch. There was a bit of development for Vimes that I liked more, but it does have to be seen first-hand really.